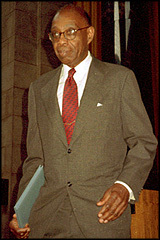 GEORGE WALKER INTERVIEW . . . . . . . . .
One of the saddest days of my life was when WNIB was sold and changed format. 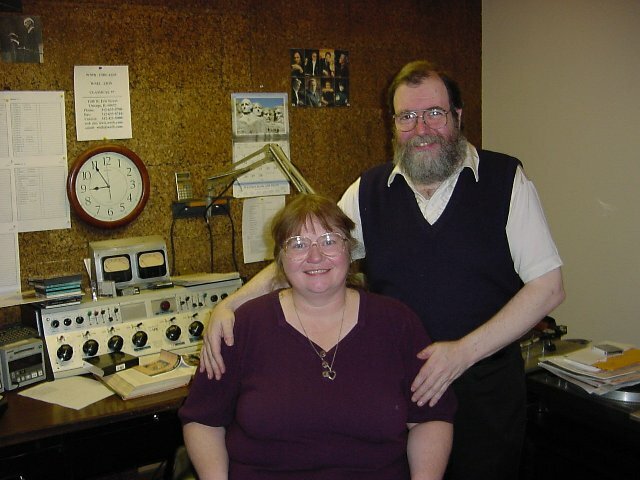 For 45 years, it had been an all-classical station, and for just over 25 of those years it was my home. My entire career was wrapped up in "Classical 97," and it fell to me to pull the plug. For more details and photos, please read this article which I wrote for City Talk magazine about it a month later. So what piece of music would have the honor and distinction of bringing this #1 classical station to a close? Amazingly, I had a few weeks to ponder the situation. Suggestions poured in from the big, obvious, triumphant bombast to the saddest melancholy to the strangely weird. Fortunately, I had the presence of mind to keep the selection an absolute secret from everyone - callers, advertisers, even the management of the station. No one, not even my girlfriend who was with me in the control room [photo], knew in advance exactly how I would bring the place in for a landing. I wanted something special, reflective, tender, strong, and positive to end. Rather than an announcement, I made my spoken farewell first and then my chosen musical work: Lyric for Strings by George Walker. The calls and e-mails which I received after that were bittersweet, but they all said the same thing - that I had spoken eloquently, and had chosen the absolutely perfect piece to end. Purely coincidentally, about 5 weeks later the Chicago Symphony had scheduled this same work as part of their subscription concerts, and the MusicNOW series included a chamber work of Walker's. He came back to Chicago for these performances, and it was great to see him again after many years. He related to me that he'd been awakened early that fateful Monday morning by calls telling him that his piece had ended WNIB, and he said he knew instinctively that it must have been my idea because I had presented his music regularly in Chicago for so long. 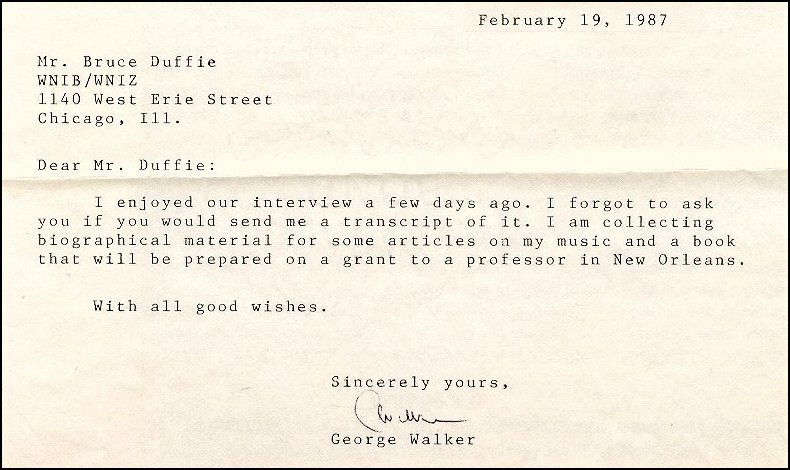 I originally contacted George Walker in the mid-80s, and because a trip to Chicago was not on his calendar, we did the interview over the telephone. Several years later, he finally did come, and we met briefly during his crowded schedule. We kept in touch as his career blossomed and praise kept coming his way. Eventually, as we all know, he was awarded the Pulitzer Prize, so his stature and reputation are now absolute. What you are about to read is that conversation from February of 1987. Of course, Walker is one who will always stand by his beliefs and would never alter his outlook because of prominence, but these thoughts and ideas are, perhaps, more pure and untouched by wide-spread fame and recognition. Bruce Duffie: You've been teaching musical composition for quite a number of years? 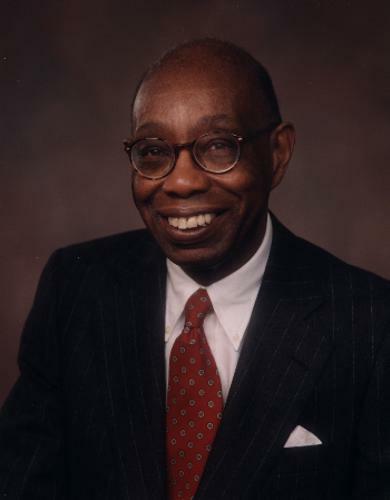 George Walker: It hasn't been just musical composition. In fact, that's been a very limited part of my teaching. Over the years, my teaching has really centered around advanced theory courses, and since I've been at Rutgers, a number of other courses in music history, romantic music, 20th century music and orchestration and even conducting. I did teach composition for a few years at the Peabody Institute of Johns Hopkins University. That was the only time in which I had a class of students rather than the occasional student taking 'special studies,' though the lessons were individual. There was never a great deal of interest in composition or students sufficiently advanced who wanted to continue in that particular area as opposed to music education or piano. I've taught piano ever since I started, though not in recent years, except for coaching students or young artists who were performing my music. BD: I'm always curious, especially from a composer who has made a reputation from composing, to find out if musical composition is something that can be taught, or must it be innate from each individual? BD: Where is the balance, then, between technique and inspiration? GW: I really don't like the word 'inspiration.' I like very much what Nadia Boulanger said because I always felt that this was the essence of what people call inspiration - finding. One finds something. BD: So it's really discovery? GW: It is discovery. It's not something that descends like a mantle from above or something that one senses through smell or taste. It is a matter of encountering something that provides the genesis to motivate the direction in which you want to go. BD: When you're teaching music history, do you encourage the students to write pieces on their own as well as just learning about pieces which have been written by others? GW: I do that in my advanced theory course, using the technique of following models. In other words, setting up parameters for the student. I feel very strongly that students need the kind of guidance where they must work within certain boundaries in terms of form. The idea is to follow a style which I don't teach but do imply. I haven't had a lot of students who are advanced, and those who are, in the sense that they have tried advanced techniques, often lack basic techniques of harmony and counterpoint, which still provide the foundation that most composers don't have today. Therefore, the music of the past is something that we must understand, be able to dissect and analyze, and even duplicate in part so we can better understand what is good taste, what is the essence of a well-constructed work. GW: Good taste on the part of the composer. The public we can't do anything about. They swallow what's given to them or they regurgitate it. BD: What do you expect of the public that comes to a concert which includes your music? GW: In one sense I don't expect anything because I know they're at a terrible disadvantage which consists of certain obvious factors that are extremely important. They don't know how long the piece is going to be - even if they read the program notes, which the critics don't seem to do! They don't know what style the piece is going to be unless they have some experience with the composer over a number of works, and it might not follow what they do know of a composer's work. The only way to overcome that disadvantage is to have a performance that is scrupulously well-prepared and which attempts to represent the details of the piece, not just an overall kind of impression of it. The only thing one can hope is that the audience isn't going to reject the piece before they start to hear it, or even to stop listening after the piece has begun. BD: Is this a problem that gotten better or worse in the last 15-25 years - the idea of an audience not wanting to hear something new? GW: I don't really know whether one can say because we read reports of premieres of 19th or even 18th century composers. The idea of rejecting something, perhaps not from the point of view of the audience, but from the point of view of the critic, is something that is very frequent. Aside from a few outstanding examples of the audience creating an uproar at the Rite of Spring, there haven't been too many documented examples of audience rejection. We know about critical rejection and we know about composers rejecting other composers. In the 20th century we have such a diversity where the music is not conforming to a style of a particular period that the audience is going to be discriminating in both the best and worse sense. There's just so much to choose from and because of that, there's a certain amount that can be disposed of and regarded with an amount of dislike. BD: Do you feel it's a good thing to have so many divergent styles available today? GW: It's inevitable with the passage of musical time. The one lamentable thing is what I consider the state of musical pollution that exists. We can't escape from music in stores or even when we're walking in the street or taking the bus. That's the kind of thing which is most distressing to me. BD: Would it be especially distressing to you to be in an elevator and hear a snippet from one of your own works? GW: I would be a little embarrassed because I would be the only one who would know it, probably. BD: Do you think that classical concerts should try to attract the kinds of numbers that the popular concerts get? GW: I feel very strongly that what is known as Concert Music is music for the elite. I remember trying to explain one obvious difference between popular music or rock music and classical music: you have to sit still when you listen to classical music. This is what one expects, so it becomes a physical state for reception. One has to make an effort to receive what is coming and to try to determine what one is hearing. The greater part of the public isn't interested in doing that. They want to respond immediately to stimuli that are unquestionably strong and which require bodily movement. It's not that one can't experience a similar sensation when one hears a Strauss waltz, but the aspect of popular music infiltrating what is known as classical music, which is really extremely pronounced in certain types of composition, is still not what one necessarily associates with music like symphonies or large choral pieces or cello sonatas. BD: Should we try to eliminate the great polarity between the two? GW: Well, of course the reasonable thing simply is to try to get the larger public interested in the medium that is really essentially for the elite. I say elite not because I want to use the word, but simply because of the fact that it does represent a choice which we can't understand, we can't comprehend. It's not to say that a person who's brought up as a middle-class person is going to be part of the elite or a person who's family can be multi-millionaire is going to have any more understanding or any more desire. But there is something very special and very particular that grabs ahold of a certain type of person, and that person can be working in a car wash. I drove up to a car wash and before I turned my radio off some Strauss waltz was on and this man said to me, "That's my kind of music. I don't like that boom, boom, boom, boom." BD: So then you're really talking about a state of mind that can be an individual thing that transcends monetary or class distinction? GW: No, it's a temperament, I think. It's a temperament that transcends class or monetary distinctions. A predilection that, in a sense, we can't really always explain. You could find a violinist whose family ran a grocery store, but the father loved to play the violin at 9 or 10 o'clock at night and his wife used to sit and listen and maybe she would sing. That's, again, doesn't relate to the economic level. BD: Let me change the subject just a little bit. Are you basically pleased with the performances that you have heard of your works? GW: Some performances, yes. Some I've been less pleased with. [Laughter] I had 2 premieres just last week and they were both very good to excellent. I had another piece done the same week that was a good performance. BD: Do you get involved with the performance of the work and make lots of notes and suggestions, or do you just sit back and let the performers find what they can in your music? GW: I hold myself open for possibility of attending rehearsals. In the majority of instances I'm usually never asked to sit in on a rehearsal and so I find that I just have to take whatever comes. Overall I've had good results. There have been some disappointing performances and some inexcusable performances, but overall the results have been good. Now and again, I get a really excellent performance, but that's quite rare. BD: Has there ever been an instance where performers have discovered things in your music that you didn't even know were there? GW: Not really. Occasionally someone would say, "This sounds a little like Mahler." It's usually a reference to another composer, and I don't really think that I've been surprised. I've been more surprised by the way the music has been distorted than the fact that they've discovered something that would help the performance. GW: There is a certain unevenness there, even in my own performances. I'm very much interested in the sonic quality of recordings. One of my earliest recordings hasn't been bettered, but the sound is mediocre, and the engineer was really poor, I feel. The performance is good, however. BD: Are you the ideal interpreter of your works? BD: With the proliferation of recordings today, do you feel it has done anything to affect either the audiences or the performers of new music? GW: Recordings have made music available, even though the proliferation the same music becomes very confusing. With 12 or 15 different recordings of the Tchaikovsky 6th Symphony, it's very difficult to choose. It really doesn't make any difference if a reviewer says this recording is three minutes shorter than that recording. In the case of new music, which represents a very, very small percentage of what's done, as long as it's available in the catalogue, it then becomes useful. I feel quite strongly that we - the public and the musicians - have been manipulated by the elimination of the LP from the catalogue. Regardless of the merits or demerits of the CD, both of which could be argued very sensibly, the analogue catalogue represents a tremendous body of reference works. Even though many of them will be presented on CD, the absence of the Schwann Catalogue means you don't really know the existence of these recordings. It's rather pathetic to go into a store and try to find something. On the other hand, with the CD you have better sound sometimes. I'm particularly pleased with Frederick Moyer's recording of the 4th Sonata. He commissioned the work. BD: I assume you get many commissions. Do you also have time to write things just because you want to get them out? GW: Not really. I only have time to meet the deadlines of each commission. BD: Then how do you decide which commissions you'll accept and which you'll decline? GW: They've been coming in at a fairly steady rate, occasionally overlapping. But I have yet to be in a position to turn down a commission for lack of time to fulfill it. BD: Is there a circumstance where you might feel you don't want to do a particular kind of piece? GW: Right now I'm faced with a dilemma about a possible commission. I'm not quite happy with the circumstances under which the work would be presented. A number of my works have been for unusual combinations. In one case, the particular instrumentation was presented and I was firmly told that was the way it had to be, and I found that the piece became a rather interesting challenge to be met. Another work from a few years ago, for clarinet and piano four hands, is probably the only extent work of its kind. GW: No, I haven't and I doubt if I will. From time to time in the past I've had a small amount of interest, but the idea of working with a librettist bothers me somewhat. I have thought about subjects or plots that I might find workable from a musical point of view, in the sense that they would seem to make the effort and time worthwhile to create a good work. But working with a librettist or even writing my own is something I just haven't been able to face. BD: When you're writing a piece of music, how do you know when it's finished? How do you know when to put the pen down and decide there's no more tinkering to be done? GW: The moment I stop and think, "When can I finish it?" [Laughter] I like to get it finished as soon as possible. I try to find a logical point to end the piece. I'm not willing to allow it to go on and on and on, and then come back to decide where it should have been stopped. BD: Is the act of composition fun for you? GW: I don't regard music as fun at all. This is not to say I don't enjoy it, but maybe there is some kind of deep Puritan ethic I have that tells me I have to work at something and try to make it as good as possible. I am relieved when it's finished and feel that I have put together something that I can live with without being embarrassed or having to question it. BD: Do you ever go back and revise works? GW: Usually when I finish something there may be a note here or a rhythm there that bothers me and I don't quite know a more satisfying solution or replacement. If time passes and I go back, I'm usually able to find something that is more satisfying, but I work slowly enough that I must avoid any wholesale revision. I try to work very carefully when I start so I don't have to sort it out and start again. BD: I just wondered if there were any old versions that musicologists will have to sort out later. GW: I don't work that way. I try to work from beginning to end and try to arrive at a completely satisfying work with a few things that need to be punched up. Sometimes it takes a little time to do it, but there are no wholesale revisions. BD: Is it generally wrongheaded for musicologists to try and look through composers' wastebaskets? GW: Different composers have different approaches to composition. I think the wrongheadedness is related to trying to incorporate things the composer had obviously discarded into something that the composer intended to keep. I'm thinking specifically of the Symphonic Etudes of Schumann. Pianists these days are including in their performance some variations which were not published by Schumann, and in virtually every instance are inferior to what he decided to publish. This is done to generate interest. Discovering a 'new' work of someone becomes a long-lost masterpiece. The value of the discovery is inflated. It may deserve to be played, but it's usually far from being a masterpiece. In the long run, though, things even out and we know what the good things are and what's not so good. BD: Should there be a place in the repertoire for pieces that are less than great? GW: The so-called standard repertory is very narrow, and it's really a matter of elevating pieces that are sure-fire to a certain plateau. They are undoubtedly well-composed and well-structured and bear repetition. When you talk about pieces that are less good, the question becomes how much repetition can they stand? 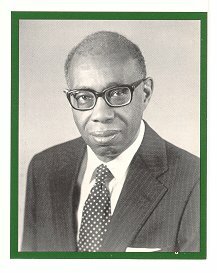 BD: Then let me ask an indelicate question - how much repetition can the music of George Walker stand? GW: That, again, is one of my primary objectives. I'm not really concerned with pleasing the public. I can't please the public because I don't know what the public wants. Even if I know what the public wants, I don't know that I could give it to them. I try to write something I'm going to be able to live with and hope that others will begin to find some of the things that I feel have given certain strength to the music. I don't really believe in creating something that doesn't have any strength. BD: Are you conscious of the public at all when you're writing? GW: I never think about the public. I never think about the performer. I have a great deal of respect and admiration for performers from a technical point of view. If it's within the range of their instrument, they can do it. Knowing that, I don't worry about whether or not it's going to be done. BD: As you approach your 65th birthday, is there anything that has especially surprised you either about your own music or music in general? GW: I couldn't say that I'm surprised. I felt all along that I would possibly get into synch with the world. I was clearly out of synch for a long time. I was ahead of my time as a pianist when the concert managers didn't want to accept a black pianist. I was writing music that wasn't performed except by a few people for a long time, and I made an effort to concentrate on getting my music published with no success initially and then little success, and all of a sudden I made the acquaintance of Paul Kapp, a very remarkable man who died a few years ago, and who published the bulk of my music because he believed in it. To him I owe an enormous amount of gratitude because without those publications, the performances of my music would be limited. He had a firm belief that it was important and should be widely heard, and the publication has provided me with a base to attempt to widen the awareness of my music. BD: You brought up the situation of discrimination against the black performer. Has this situation improved over the years as much as you would like? GW: No, it hasn't improved as much as I would like. Obviously I've had some wonderful opportunities, but considering the kind of satisfaction and critical praise my music has gotten, it would seem to me that I would have deserved even more performances by orchestras other than the New York Philharmonic. They have done five works of mine. Chicago, Philadelphia, Pittsburgh, St. Louis have done none. From the point of view of the success of the Black Composers Series of LPs, the praise was heaped upon them in general and specifically about certain of my works. I've been trying to find out if they will be re-issued on CD, but so far the full set is only due for release as an LP Box on the College Music Society label. BD: I don't want to belabor the point, but I want to ask about how you're listed in various reference books. 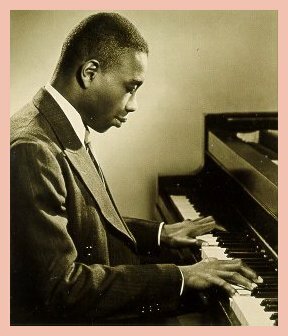 They give your name and your birth date, and say, "Black American composer and pianist." Would you rather it just be "Composer and pianist?" GW: There are two sides to that. 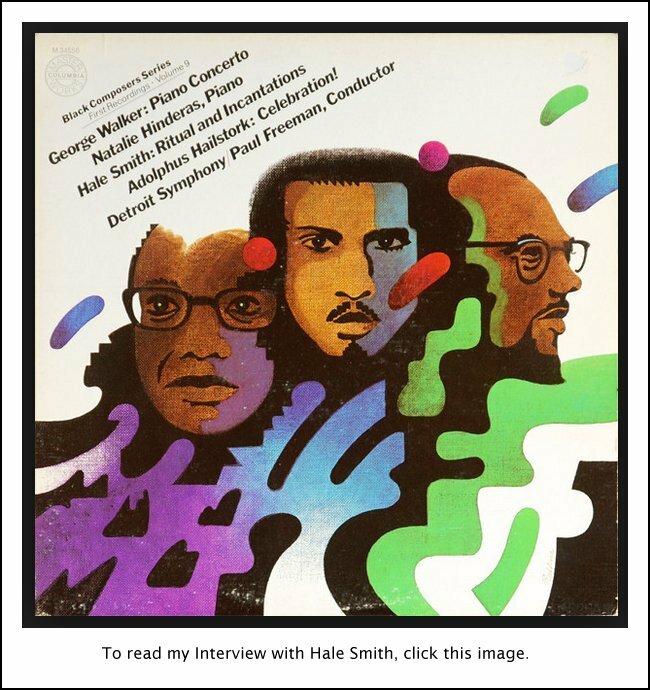 I've benefited from being a Black Composer in the sense that when there were symposiums given of music by black composers funded by the Rockefeller Foundation, I would get performances by orchestras that otherwise would not have done the works. The other aspect, of course, is that if I were not black, I would have had a far wider dispersion of my music and more performances. It's a two-edged sword and I think that one can take the stance that if you remove "black" from my name, it's going to be more meaningful because I'm still an outsider and will continue to be an outsider from the coterie of well-known and established white composers. Of course I'd like to have more performances by major orchestras because this is the area in which you reach the wider public. BD: More so than recordings? GW: If they don't know your name it's unusual for them to buy discs of your music. Of course if they read the reviews a lot of people have become interested, particularly if they associate a review with a particular medium. I don't know how many performances there have been of my Trombone Concerto, but when the work was written in 1957, Emory Remington, who was then teaching trombone at Eastman, said it could only be played by a couple of trombonists in the whole world. Now trombonists everywhere know the work, but there are few who ever have the opportunity to play solo with a major orchestra. I had to be persuaded to have a piano reduction made of the orchestral part. I was against it even though it seems almost kind of ridiculous to be against publication, but I thought it would not do justice to the piece. BD: You wanted a concerto not a sonata! GW: That's right, and I wanted all the colors associated with the orchestral textures. But my publisher kept after me and I finally said all right. Now trombonists know that the piano reduction is available. BD: Did you do the reduction yourself? BD: Then it's at least that much authentic! GW: Yes. But coming back to the idea of reading reviews, sometimes a pianist will read a review of one of my sonatas and he or she might be interested in finding out whether it's something that would lie well in their hands or not. But this is done on an individual basis and I know it happens. Whereas you have an orchestral performance and all of a sudden there is a work out there in front of many people at once. It's not going to be completely comprehended but there are program notes and a biography and there is this group assembled to absorb the music. GW: I don't really think about the future of music. I always felt that there's an effort to try to predict that music was going in some direction, and after five or ten years it's obvious that that direction was leading nowhere and composers saw that. At the same time I'm against the "Music of the Future." This is nonsense from my point of view. First of all, I don't really think that there are any geniuses of the sort of Mozart and Beethoven around to 'direct' music into any particular style. Secondly, it just occurred to me today that the most important figures, at least from the 18th and 19th centuries, were composers who weren't really concerned with the future of music - meaning the experimentalists who think they had to find something by banging on a tin can in a parking lot. I'm talking about the persons who, on the basis of their awareness of the past and their own kind of personal intensity, have actually created synthesis. It's the synthesis that creates, for the most part, the works of importance. This is not to say that the works are going to be looking backwards. Any kind of creative effort must attempt to say something new, and if it's not a conscious attempt, it's a subconscious attempt to reveal something that is new from the point of the composer's background, experience and output. BD: Is this the advice you have for young composers? GW: Young composers must look ahead, but I don't try to advise young composers because those who have talent are obviously looking ahead and if their talent develops they will undoubtedly have the good sense to look not only ahead but also around them and absorb what there is from the past and present, and still think in terms of what they can forge for themselves that is different. I don't really know any young composers who are serious about developing into important composers. If there is enough talent and patience and hard work, they will eventually be able to come to terms with what they want to do and what they can do. My concern is not just writing one work or two works, but building a repertory of works. BD: We hope that it continues for many years. GW: Thank you very much. A few days later, I received this letter from the composer . . . . . This conversation was recorded on the telephone on February 14, 1987. Portions were broadcast on WNIB in June of that year, and again in 1992 and 1997. This transcription was made in 2004 and posted for use in New Music Connoisseur in their Spring issue.